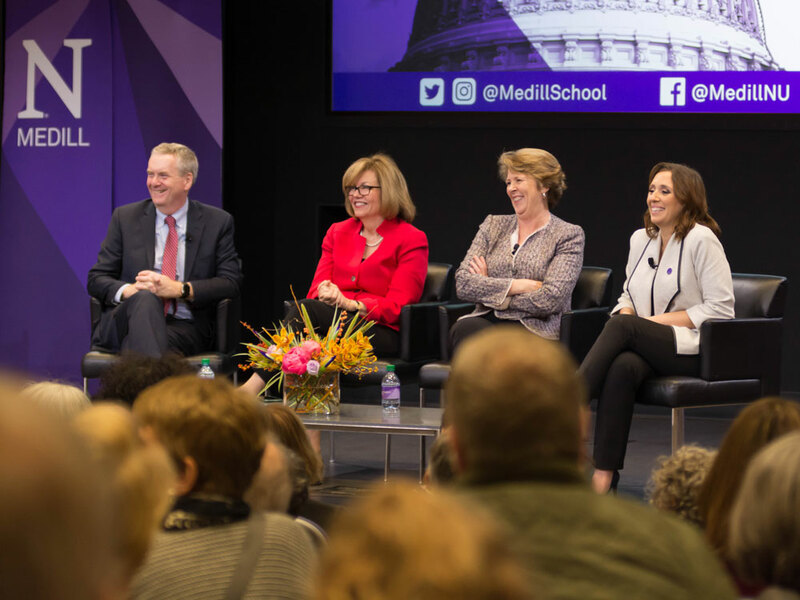 One year after President Donald J. Trump’s election, three Northwestern University alumnae – all Washington, D.C., bureau chiefs for major media outlets – returned to campus to discuss how political journalism has changed under the new administration. “The Insiders: Covering Washington Since Trump’s Election” featured Elisabeth Bumiller (BSJ77) of The New York Times, Susan Page (BSJ73) of USA Today and CBS, and Julie Pace (BSJ04) of The Associated Press and CNN. All are graduates of the Medill School of Journalism, Media, Integrated Marketing Communications. Tim Franklin, senior associate dean and professor at Medill, moderated the Nov. 7 panel, attended by 250 people. The discussion touched on factors that differentiate the Trump administration from previous administrations, including the level of access to the president, the quality of information provided by the White House and the amount and validity of information leaking from government sources. Panelists also discussed what they are doing differently in response to these factors, and they talked about the role of journalism schools, like Medill, in preparing journalists to cover an increasingly polarized world of politics. How does the Trump administration differ from previous administrations? One difference in covering this administration is how open it has been, panelists said. “Trump has been more accessible than any modern president,” said Page, who has covered six White House administrations and interviewed the last nine presidents. She noted that President Trump engages with reporters in different contexts than previous administrations, chatting as he walks to Air Force One and commenting on Twitter. The panelists said that while Trump’s tweets occasionally disrupt governing policy, they are a valuable way for journalists and the public to understand the president’s thinking. Pace added that the quantity of the communication does not always translate into quality. The journalists discussed the difficult position they are put in when the White House makes inaccurate statements. They said they weigh several arguments each time it happens, debating whether publishing the falsehood – even if only to refute it – gives it further credence. “There was a debate about, ‘are we repeating a lie and giving credence to a lie by reporting on it?’ Well it’s part of our job to point out when things aren’t true,” Pace said, adding that it’s essential that the falsity of the statement is made clear in the headline and first sentence of the story. However, the panelists said the decision of whether to directly label untrue claims “lies” is difficult. What are journalists doing differently to avoid the mistakes of the 2016 election coverage and keep pace with the changing nature of Washington, D.C. politics? In addition to adjusting reporting practices to account for the different communication style of the new administration, the panelists discussed the lessons they learned from the 2016 election when media faced wide criticism for incorrectly predicting Hillary Clinton would win the presidency. Bumiller added that most organizations are now making a concerted effort to talk to more voters in central states that are often overlooked by major media. Pace emphasized a revived focus on political issues that matter to these voters and a determination to not get wrapped up in the politics themselves. “We have to break through the noise,” she said, adding that it’s easy to get side-tracked by the president’s latest tweet or other distractions in Washington, D.C.
All three panelists said they’ve increased staff in order to keep up with the fast-paced changes under the new administration. What will political journalism look like moving forward, and what role do journalism schools like Medill play in preparing journalists to cover an increasingly polarized world? Asked about the president’s frequent critiques of the media, the panelists emphasized the importance of remaining focused on quality reporting. Page raised concern about the rhetoric against journalists and the current Justice Department’s apparent approach to reporters. Citing an increase in the number of leaks from government sources and the importance of the information revealed by those sources, she said there is some uncertainty about the consequences journalists would face if they refused to reveal their sources. The panelists agreed that the best defense against attacks on the press is accurate, transparent reporting. Pace referenced the public appetite for verifiable information, evident in the stories that attract the most views. The panelists emphasized the need for skilled journalists to continue producing quality reporting that the public trusts. They said the press is an essential check on government, and holding public officials accountable requires strong ethics, perseverance and a desire to make a difference in the world by telling hard stories that matter. They emphasized the importance of schools like Medill in instilling these values in future journalists. Sydney Alman, a senior studying journalism and political science who introduced the panel, described the event as inspiring. "It's incredible to see these women in positions of leadership with major news media," Alman said. "Seeing them reassures me that this is a path I can follow too."